One of the things I love about Adobe InDesign is that there’s usually more than one way to accomplish virtually any task. Take placing images in your document. InDesign offers a plethora of options to improve productivity in this area, thanks to keyboard shortcuts. Of course the basic method for placing an image is to simply hit Command-D, which invokes the Place command from the File menu. This brings up a dialog box to choose your image, loads the Place Gun, then places the image at 100 percent wherever you click the loaded Place Gun on the page. However, unless you’ve already pre-sized the image, you’re likely going to have to do some resizing and cropping. Holding the Shift key down while dragging the loaded Place Gun will allow you to create a frame of any shape, and scale the image inside it. However, the image will only scale to fit either the width or height of the frame, depending on the orientation of the image being placed. To get around this shortcoming, click and drag your loaded Place Gun on the page. InDesign will create a frame with the image placed inside it sized proportionally to fill the frame. As you’re dragging the Place Gun, InDesign will show you the scaling percentage of the image (as shown on the right). If you want to see the measurements of the image being placed as you’re dragging, tap the Shift key and the percentage indicator will show you the width and height dimensions instead. You don’t have to place images into your document one at a time. InDesign offers you a few ways to quickly place many images at once, the easiest of which is to select the images you want to place in the Finder, and simply drag them into your InDesign document window. While this is certainly quick, it’s not exactly painless. Your images will be placed in cascading fashion at 100 percent—requiring a lot of work cropping and resizing. Instead, use the method I’ve already described above. Invoke the Place dialog box (Command-D), and either Shift-click or Command-click to select the images you want to place. Once the Place Gun is loaded with your images, hold down the Shift and Command keys and start dragging the Place Gun. Once the proportional grid of image frames appears, you can release the Shift and Command keys (keep the mouse button held down) and continue dragging the frame grid out to your desired size. 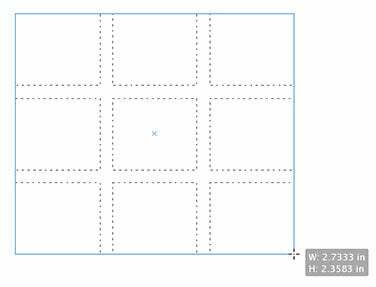 InDesign will place your images in a 3-by-3 grid by default, so if you have more than nine images loaded, you’ll have to drag-out more than one grid. While handy, this isn’t ideal. If you have a specific grid in mind, you can customize the grid on-the-fly by using the Shift-Command-and-drag method described above, but when you let go of the keys, you can use the Up and Down arrow keys to increase or decrease the number of columns, and the Left and Right arrow keys to increase or decrease the number of rows. Though you’ll have to go back and size each image inside the frames if they’re not scaled to fill the frame, placing your images in this manner creates a nice even grid with equal spacing between each image frame. But what if you don’t want equal spacing? Let’s say you want the images to have more space below each image frame so you can add a text box below each image. No problem. 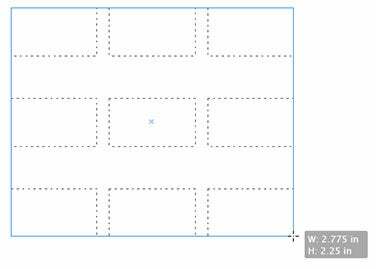 These methods of placing images in grids can be of particular value to designers working on product catalogs, contact sheets, or any project that requires image grids. One final tip: As you may know, InDesign offers Import Options when placing images into your document. In the Place dialog box, you’ll find a checkbox at the bottom that allows you to turn on and off the Import Options. I prefer to have this feature turned off, as more often than not I’m placing a single image. However, you can temporarily invoke the Import Options dialog box by holding down the Shift key while hitting the Open button. This is particularly useful when you want to place on a single page of a multipage PDF file, or adjust which color profile an image includes when placed.